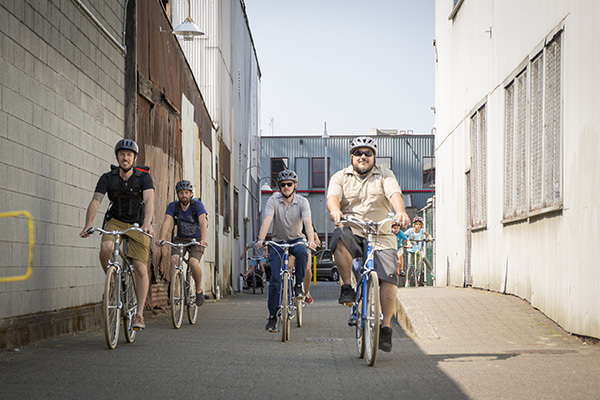 Length: About 2 hours, but you could spend all day on Granville Island. 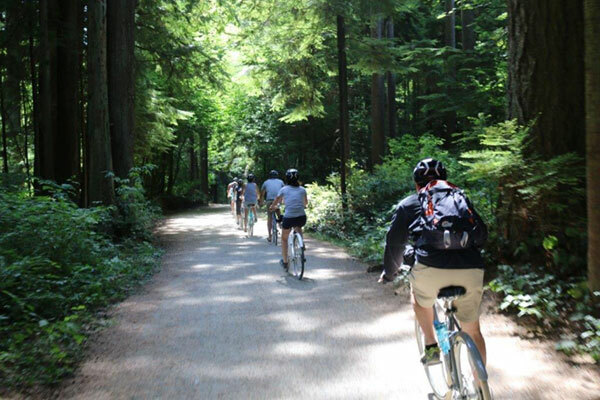 The ride to Granville Island is a beautiful easy ride along False Creek. 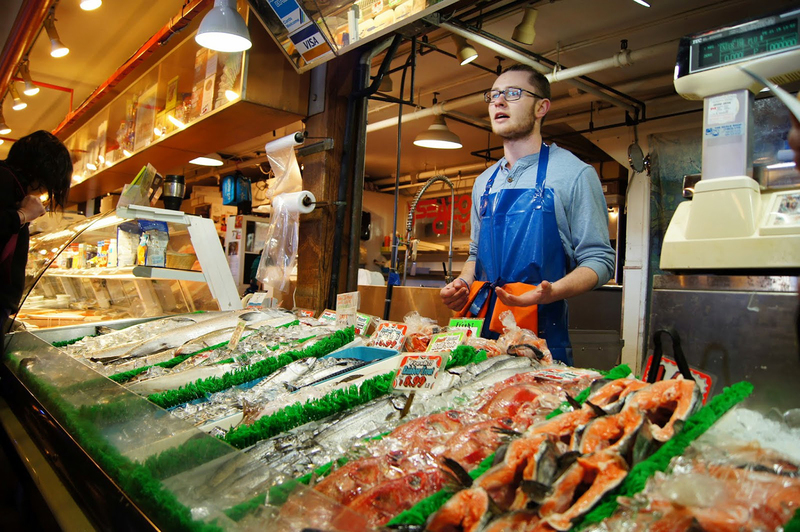 We send as many of our guests to Granville Island as we can to experience the exquisite local food, fantastic art galleries and souvenir shops, and of course the world famous marketplace. 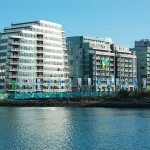 The False Creek area has blossomed into a gorgeous backdrop for cutting edge architecture in the Olympic Village. 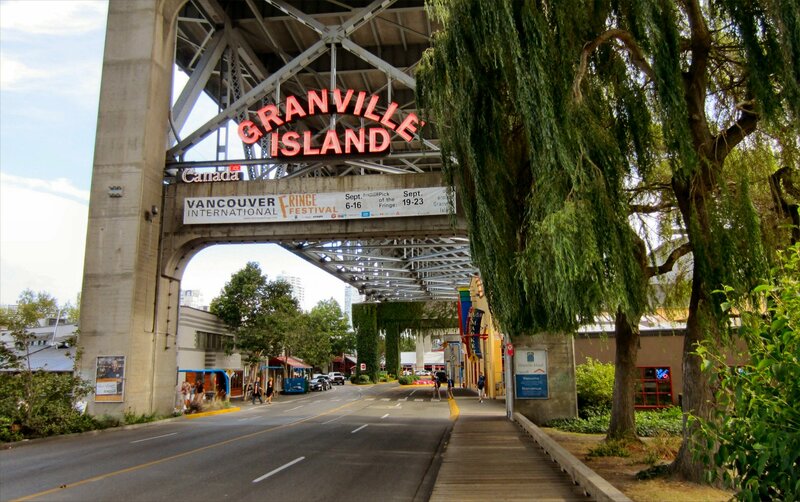 Before the colonization of Vancouver, the area that is now Granville Island was a simple sand bar used for fishing by the local native village Snauq, located on Kitsilano Point. This area is the setting for many radical transformations; once a centre for industry, with shipbuilding, saw mills and rail yards dominating the land. 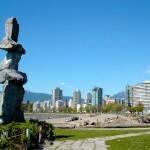 The second large change occurred when Vancouver hosted Expo 86, which used the empty industrial lands as a venue for the event. 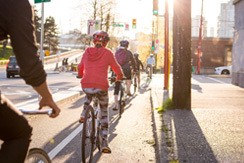 The history of False Creek can be found in several monuments, signs and namesake community centres along the route. 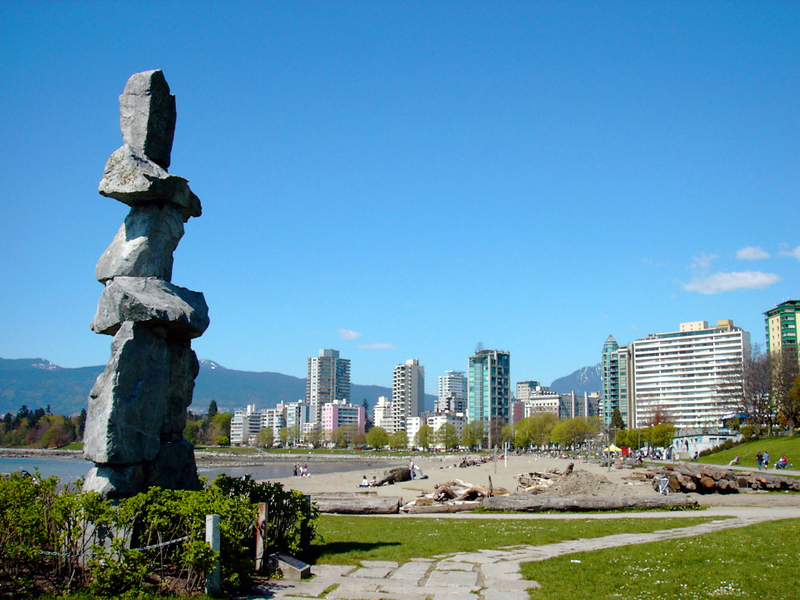 English Bay Inukshuk – With its stunning mountain backdrop, this monument is a nod to the first nations history of the land and a fantastic photo-op. 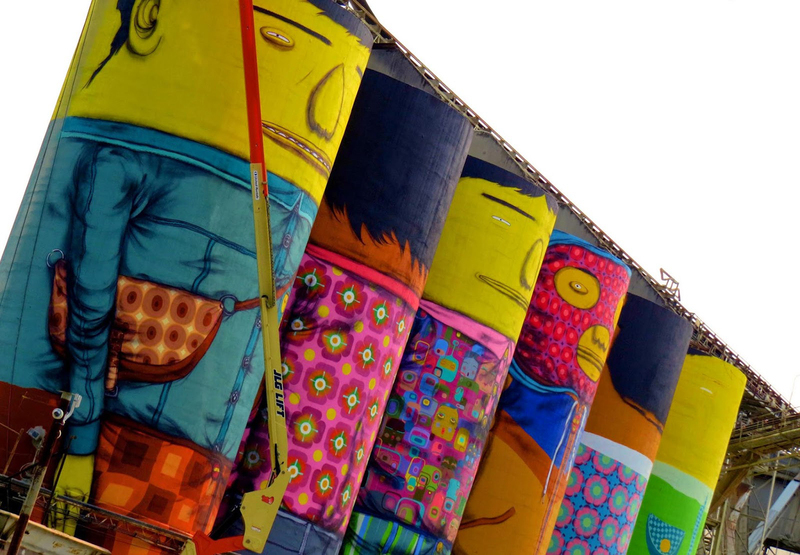 This two-storey art piece by Alvin Kanak was a gift to the city of Vancouver in 1987 for the World Expo. The Inukshuk is also the symbol of the 2010 Winter Olympic Games. 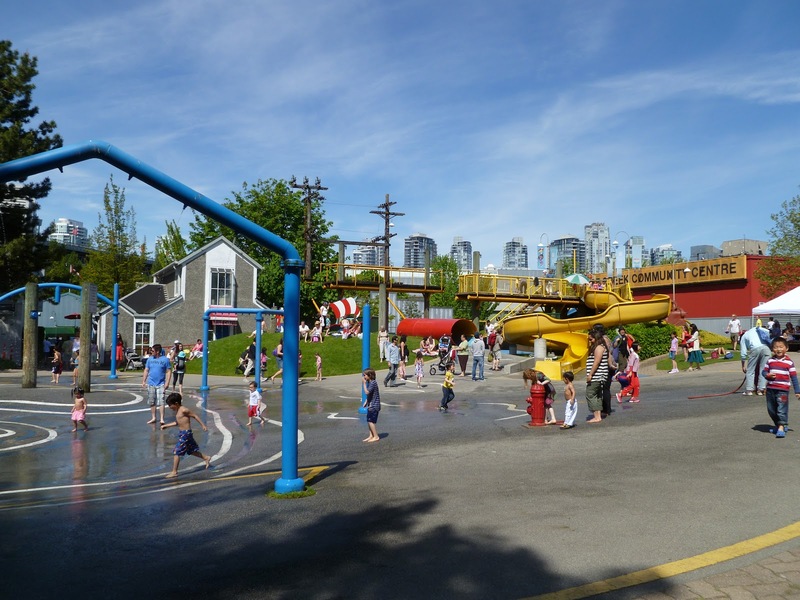 Roundhouse Community Centre – Hop off the seawall for a few minutes to take in this historic Community Centre. Built in 1887, the community centre has undergone many restorations to make it the beautiful sight it is today. 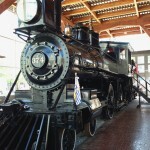 The spotlight for visitors is Engine 374 on display. 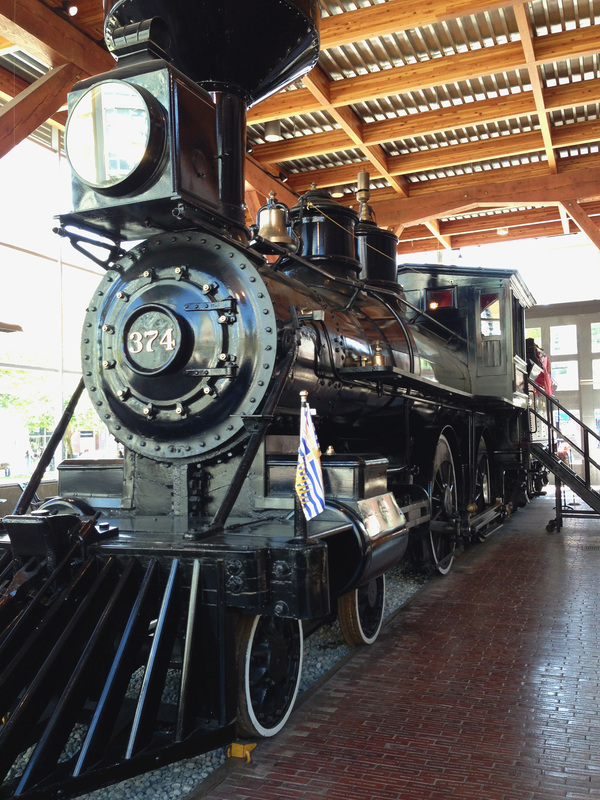 This was the first passenger train engine to enter Vancouver in 1887. It was restored and displayed for the World Expo. 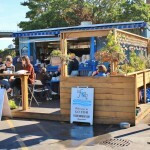 Sole Food Farm – Farming in the city? 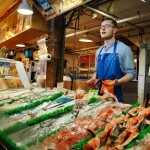 Yes this is now a reality in Vancouver with Sole Food Farm. 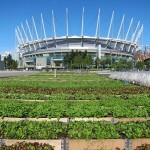 Situated on some of the empty parking spaces near BC Place, Sole Food Farm has 2 acres of planters utilizing this warm sunny space. They grow all sorts of produce all year! 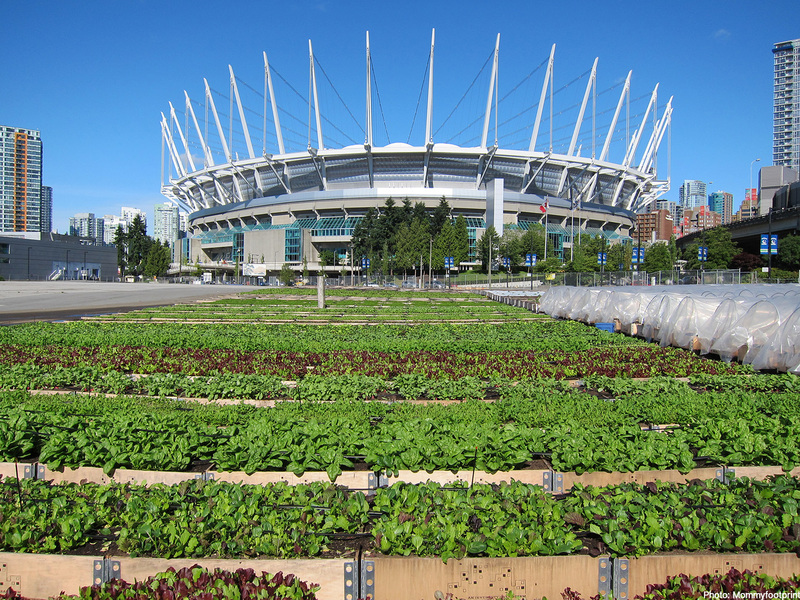 The farms provide meaningful employment for people with limited resources in the downtown eastside. 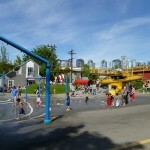 Science World– Science World is a long established popular attraction for locals and visitors. There is a small outdoor display and a Rube Goldberg style ball machine that you could watch for hours! 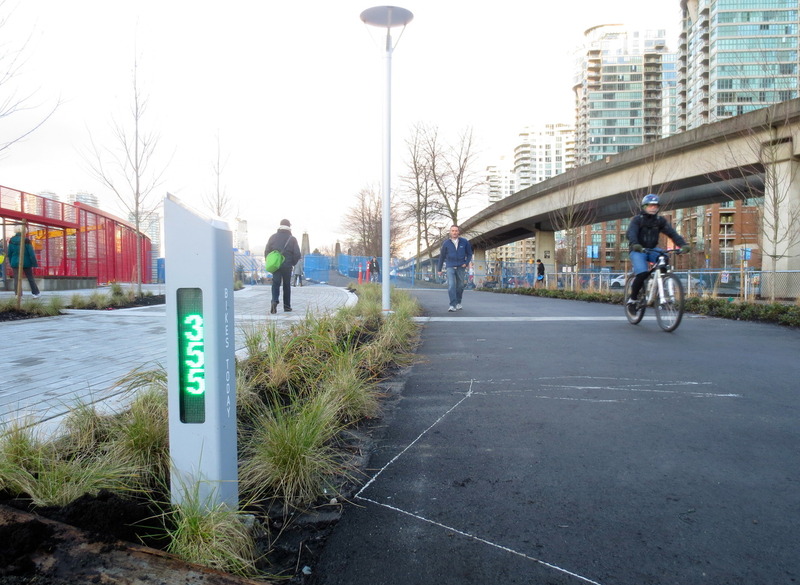 Bike Counter at Science World – As you ride by this area, be sure to be on the lookout for the Bike Counter! 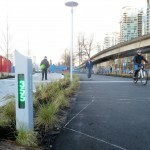 Installed by the city of Vancouver, it counts the number of bikes that pass day to day. 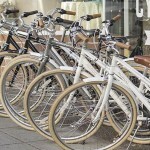 You’d be surprised how many bikes go by per day, even in the rain! 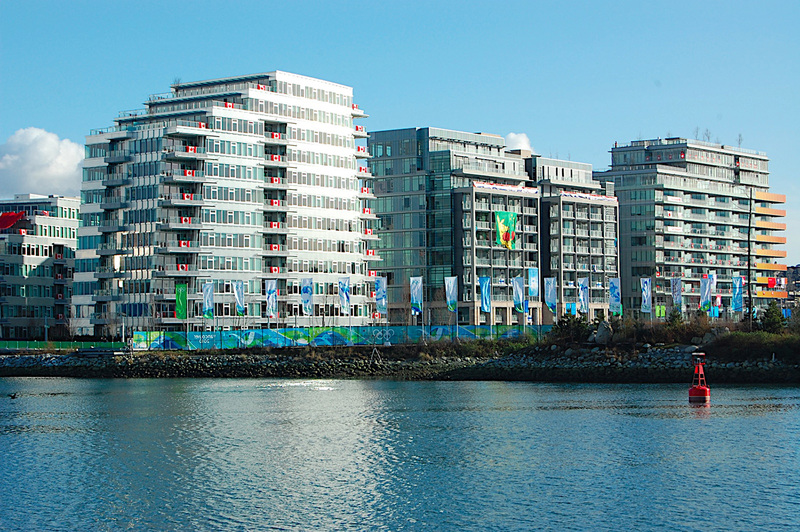 Olympic Village – In 2010, the millennium group opened the Olympic Village to international athletes to stay while they competed in the Winter Games. These buildings are now residential developments utilizing some of the most sustainable initiatives known today. Solar panel energy, water efficiency, and tons of green space are just a few of the elements that make this area an award winner for Urban Sustainability. 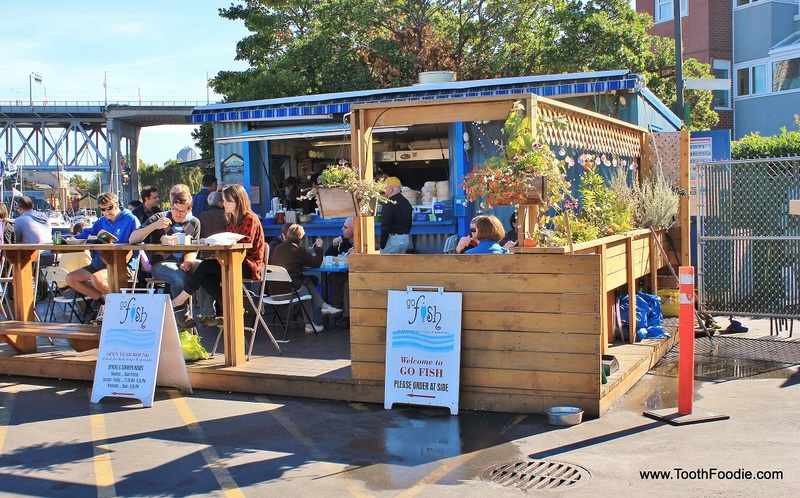 Food Cart Festival – Not just food! 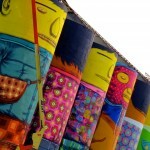 There are kids activities; live music, farmer’s market vendors and more at this festival that runs all summer long. 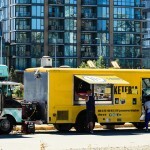 Definitely some of Vancouver’s finest portable foods. 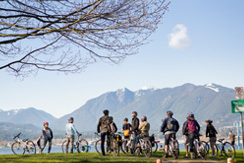 It is impossible to miss as you cycle by on the seawall, so head in and take a look! Admission is $2.50 or free with a non-perishable food donation. Earnest Ice Cream – The best ice cream around! Kids Water Park – The biggest free Water Park in North America! The full park is open on the weekends during the summer with a great big water slide. Bridges – The older establishment on the scene, Bridges has been around for thirty years! 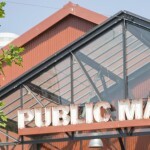 The Public Market – Can’t go wrong with having everyone in your group pick their own favourite food from the market. Granville Island Toy Company – An absolutely massive inventory of every type of toy you can imagine. Take a half hour to absorb it all and find your inner child. 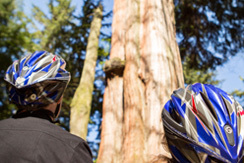 MAKE Vancouver – One of the best gift shops around, find a funky innovative gift for your loved ones here, or create your own with their custom ordering. Dundarave Print Workshop – Explore the fine art of printmaking with this not-for-profit organization located in the Net Loft Building. Eagle Spirit Gallery – The largest gallery in Vancouver to sell First Nations Art, the Eagle Spirit Gallery has been around for nearly 25 years. A huge collection of Northwest Coast and Inuit art, textiles and original paintings. 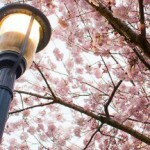 English Bay Gallery – One of our favourite galleries on the Island, the English Bay Gallery is exclusively Vancouver-based in it’s themes. Wander through the massive prints of stunning photography of architecture, the original paintings of BC wildlife, and purchase a fantastic greeting card by a local artist. Federation of Canadian Artists – Truly an example of what Canadian artists are capable of, the exhibits at the Federation of Canadian Artists change every few weeks. There’s also workshops for adults and kids throughout the year. Backstage Lounge – Spectacular views of False Creek during the day, and awesome live music at night. The Backstage Lounge is a regular local hangout. One of our guides Nick has a band that regularly plays there! Ask him about it! TheatreSports – This venue hosts international touring comedy acts, and their own After-Dark nightly Comedy Improv show. 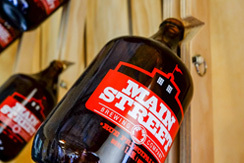 It’s a Vancouver local favourite and you’ll see why. Arts Club – The largest theatre company in Western Canada, the Arts Club develops a rotating number of shows throughout the year. The capacity for this venue is comparatively small, making for an intimate evening of quality theatre.